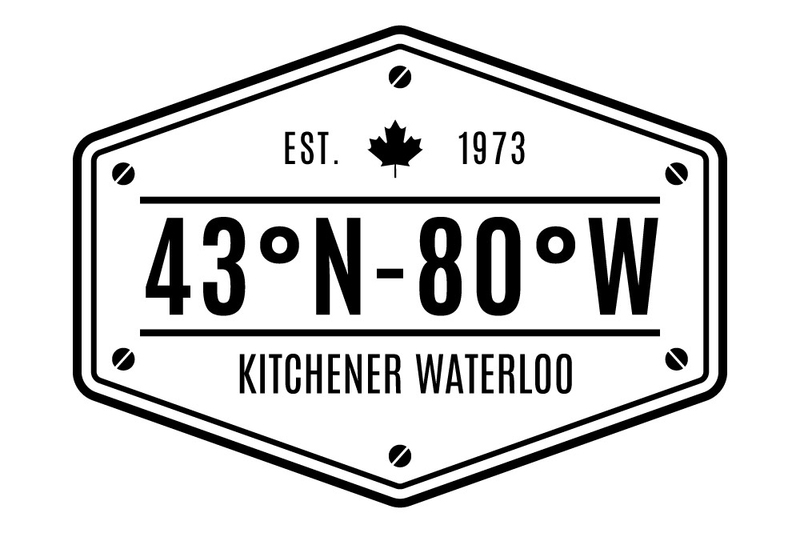 An up-and-coming online, local, hometown pride clothing brand, 43×80, has begun selling its merchandise to the general public focusing on the idea of taking a piece of the Kitchener-Waterloo region worldwide. With an emphasis being put on locally-made and sourced products and clean and simple designs, this “lifestyle brand” business sells clothing from shirts and sweaters, to hats and throw pillows. The numbers in the company’s name, “43 degrees North by 80 degrees West,” are the geographic, GPS coordinates of Kitchener-Waterloo, meaning the company is making Waterloo region its focal point. Its logo, which features the phrase “Est. 1973,” refers to the creation of the Regional Municipality of Waterloo. The region was formerly called Waterloo County which was created in 1853. Though Alli Bearinger, the founder of 43×80, is a newcomer to the business world, she is enthusiastic about creating a sense of unity in the Kitchener-Waterloo area. “I wanted to do this for a long time but didn’t know how to go about it. I had all these ideas and I had the creativity, but I didn’t know how to execute it,” Bearinger said. As someone with a lot of pride for her hometown, Bearinger couldn’t help but believe that there were others that felt the same way. “I wanted to start paving the way for people to join together and show people that KW is on the map and we’re proud of it — and [to] look out [for us],” Bearinger said. The business officially launched four months ago and has been garnering attention from the regional community within the last two weeks. Currently, their most popular item is the “Uptown Downtown Smalltown” basic t-shirt. “There are always things going on, people to connect with. There are always things to do — and it’s a beautiful part of Canada,” Bearinger said. “But now Midtown is coming in, so I have to work with that as well,” Bearinger said. Like any new enterprise, especially for someone new to business management, Bearinger has run into a number of obstacles while establishing the company, such as where to source her clothing materials from. “I wanted to source everything from Kitchener-Waterloo — [be] the only Canadian-made and eco-friendly [product] — but from my price point, it just wasn’t going to happen. In the future, that’s maybe something we can do, but for now, it’s [impractical],” Bearinger said. Though the company is small, utilizing an online drop-shipping method of retail, she hopes to expand it through collaborations in the coming years as it gains influence in the area. “I want to eventually have a store or be featured in stores within the region, have a lot of collaborations and networking, collective thinking and creativity with different companies already formed or future companies in the region,” Bearinger said. Because there are so few stores of any kind in the region which emphasize the concept of local or regional pride, Bearinger sees 43×80 as an opportunity to feature important aspects of Kitchener-Waterloo.